Leave the M1 at Jnc 21 heading towards Leicester on the A5460. At the next roundabout turn right onto the B4114. Follow this through the traffic lights to the next roundabout (Foxhunter) where you turn left onto Blaby Road. Follow this through to the next roundabout where you take the second exit (left) onto the A426 Blaby By-pass. At the next roundabout, turn right into the village of Blaby. Take your first left and the church is located after 300yrds on the right hand side. 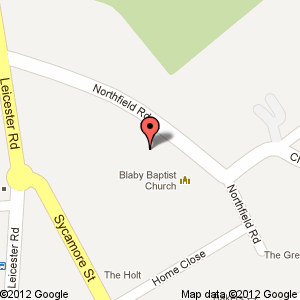 Blaby Baptist Church has a private car park opposite the church with ample parking available.